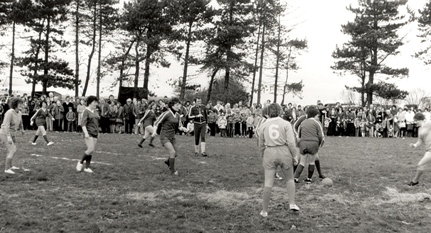 Neilston Cattle Show, Ladies' Football Match, c.1980. The Neilston Cattle Show takes place annually on the 1st Saturday in May and brings together the entire community of this East Renfrewshire village. The first show took place in 1825 and its origins are in the cattle fairs which took place in the village several times a year. However, there are also two recorded explanations for it. The first is that two local farmers were having a dispute over who had the best prize bull. This turned into a contest to be judged by other local farmers and this in turn became an annual event. The second explanation is that it had its origin in the ‘Old Cow Fair’ which was held every second Tuesday in May in the big square. This fair was declining until local landowner Captain Anderson of Broadlie decided to turn it into a cattle show. For many years it was held on his ground in Broadlie. Since then it has developed into an established agricultural show with many other attractions. Even as early as the beginning of the 20th century, one local man recorded that the show was a huge event for the whole village. He remembered that a fun fair took place, and that local householders and shop-owners usually spruced up their properties and decorated the streets. Nowadays this festive atmosphere continues and as well as livestock and equine competitions and sheep dog trials, there are pipe bands, dance displays and fancy dress competitions to keep spectators amused. The show is organised each year by the Neilston Agricultural Society and judging is still done by local farmers.